The National Museum of Australia was designed by architects Ashton Raggatt McDougall and Robert Peck von Hartel Trethowan and sits on an 11-hectare site in Australia’s national capital, Canberra. The Museum is on Acton Peninsula, beside Lake Burley Griffin. The project originated with an international design competition which the architects won in 1997. 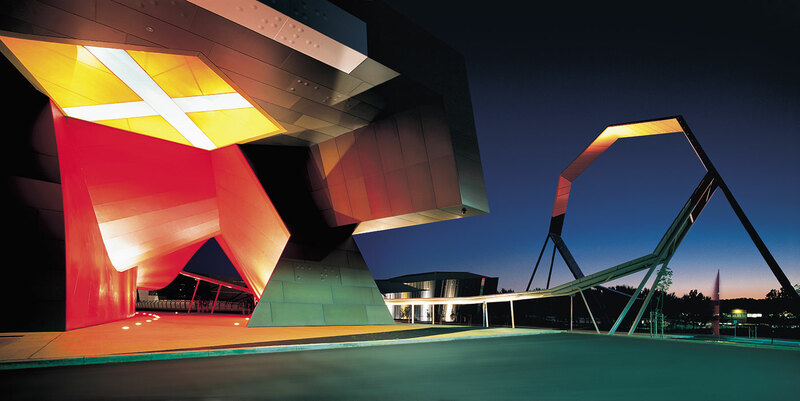 The Museum opened at Acton Peninsula in March 2001. The architecture and design of the National Museum of Australia was a milestone for a building of its type. Avoiding traditional museum interpretations, the architects developed a postmodern structure reflecting the diversity of the Museum’s collection. The most noticeable design feature of the Museum is the gigantic sculptural loop at the entrance — the most visible part of the Uluru line. The building itself, which houses 6600 square metres of exhibition space, is composed of several individual spaces pieced together like a jigsaw puzzle, forming a semicircle around the Garden of Australian Dreams. Colour is used extensively, outside and inside. The exterior is a vibrant palette of crimson, orange, bronze, gold, black and brushed silver. Textures range from the smooth finish of the anodised aluminium panels that clad much of the building to the deeply patterned moulded concrete surface of the western section. Some of the raised dimples and sunken holes are words written in braille. Visitors enter the Museum through the hall, relaunched as the Gandel Atrium, in 2018. This great light and open space with curving walls, windows and ceilings is like a huge rope knot seen from the inside. It is a metaphor for the strands that tie Australians together as a nation, the weaving together of the lives and stories of Australia and Australians. Following the line of the rope through the Atrium leads to the gallery spaces located on three levels. 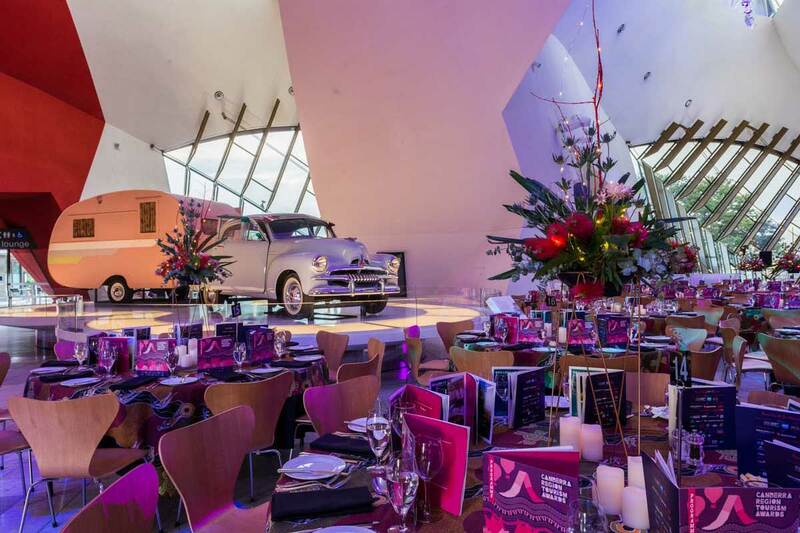 One of the Museum’s special features is the integration of exhibition and building design — for the exhibition designers colour was central to communicating stories about Australia. The Garden of Australian Dreams is a symbolic landscape – large sculptural forms within a body of water, a little grass and a few trees. Encircled by the Museum, it provides an opportunity for visitors to stop and relax as they contemplate an artistic exploration of ‘place’ and ‘home’. The design of the Garden of Australian Dreams is based on a slice of central Australia. A concrete surface depicts a highly coloured, stylised ‘map’ of the area; take one step and you travel the equivalent of 100 kilometres across the real landmass of the country. The words on the undulating surface of the map identify place and country — ‘home’ is repeated in 100 different languages. The lines that crisscross the map include surveyors’ reference marks, road maps, the dingo fence, and Indigenous nation and language boundaries. Sue Dove provides an insight into the design of the National Museum of Australia, discussing the building’s aim and function, the influence of other international buildings, contentious design aspects, and the expression of major Australian themes.